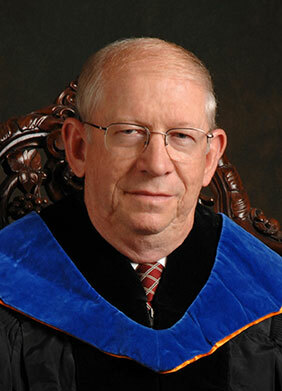 Thomas E. Wade earned his bachelor’s, master’s, and doctorate degrees in electrical engineering at the University of Florida. During his undergraduate career, Wade served in high-level officer positions for several honor societies and student organizations such as Florida Blue Key, the Benton Engineering Council and Tau Beta Pi. Wade helped organize projects to challenge non-engineering students to think like an engineer. One of his favorite activities had participants building structures with uncooked spaghetti. After he graduated, Wade collected all the keys and charms he’d received for each organization he was involved with – 16 in total. He had them turned into a bracelet and gave it to his wife as a thank you gift for all the support she offered him while he was a student. Wade’s career in engineering brought him back to academics. He was an engineering associate dean and electrical engineering professor at the University of South Florida for 24 years, after serving in a similar position at Mississippi State University for nine years. He says he has always believed that student involvement does well to prepare students for post-graduation and the real world. That’s why he believes E-Week is not only important to current UF students but to future Gator Engineers as well. Today, Wade’s hobbies include collecting antique furniture, renovating antique cars (a 1955 Jaguar and a 1982 Rolls Royce) in his garage, writing books and spending time with his nine grandchildren.